President Donald Trump pledged to boost defense spending as he basked in the nation's military might aboard a next-generation Naval aircraft carrier on Thursday. NEWPORT NEWS: President Donald Trump pledged to boost defense spending as he basked in the nation's military might aboard a next-generation Naval aircraft carrier on Thursday. 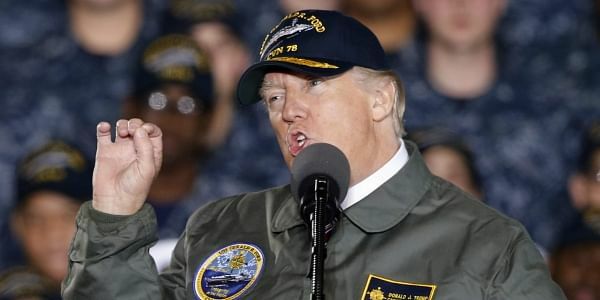 Wearing an olive green military jacket and blue ball cap, Trump vowed to mount "one of the largest" defense spending increases in history. "Hopefully it's power we don't have to use, but if we do, they're in big, big trouble," Trump said. Trump spoke from the Gerald R. Ford, a $12.9 billion warship that is expected to be commissioned this year after cost overruns and delays. He touted his spending plans, saying he would provide "the finest equipment in the world" and give the military the "tools you need to prevent war." The president also toured the carrier and met with sailors and military leaders. He saluted the sailors as he arrived on the carrier. Before his remarks, Trump was asked about the revelation that Attorney General Jeff Sessions twice talked with Moscow's U.S. envoy during the campaign, contact that seems to contradict Sessions' sworn statements to Congress during his confirmation hearings. While there were mounting calls for Sessions to resign or recuse himself, Trump stood by Sessions on Thursday, saying he had "total" confidence in his attorney general. Asked if Sessions should recuse himself, Trump said: "I don't think so." Trump also said he "wasn't aware" that Sessions had spoken to Russia and said that he "probably did" speak truthfully to the Senate. During his trip to Newport News, Trump was joined aboard Air Force One by Defense Secretary Jim Mattis. A draft budget plan released earlier this week by the White House would add $54 billion to the Pentagon's projected budget, a 10 percent increase. The U.S. currently spends more than half trillion dollars on defense, more than the next seven countries combined.